Some fighters have been, some never will be and some are always remember as great fighters. Several fighters are remember by their generation of fight fans, then forgotten, or perhaps better known as ‘the guy who fought so and so’ But every so often a man will transcend generations of fight fans, some fighters will always be considered great, some fighters are simply legends and heroes. 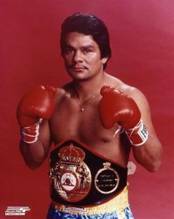 Such fighter is the most well known man ever to come out of Panama; he is of course Roberto Duran! At age 13 Roberto Duran was forced to leave school, legend has it that he punched a lad down a flight of stairs, and surprisingly he wasn’t asked back! Duran was the 2nd of 9 children and effectively the bread winner for his family. He would often raid the local mango plantation of this future manager for food, and inevitably he turned to fighting to make a living. After a brief 16 fight amateur career and after fighting pretty much anyone who would fight him on the beach, Duran turned professional aged just 16. Fighting at either end of Panama City Duran was simply unbeatable; he fought 15 times in Panama before leaving for the 1st time to fight in Mexico. In 1971 Duran debuted at The Madison Square Garden against the Puerto Rican Benny Huertas, his big Garden debut lasted 66 seconds and Duran was the winner by KO, just three fights later Duran was back at the Garden. His opponent was Ken Buchanan or the lightweight champion of the world as he was better known. In what was to be a classic, Duran and Buchanan tore into each other. The newly nicknamed ‘Manos De Piedra’ was ferocious in his assault and fought with his usual aggression and liberal interpretation of the rule book. Duran was winning the fight, but Buchanan was hanging in there, and causing Duran a few problems. The controversy of the fight came at the end of the 13th round; on the bell Duran threw a full power left hook which hit the champion square in the groin. Unable to continue the championship was handed to Duran, who to be fair was winning the fight at this moment. The 1st mark on Duran’s record came against Esteban De Jesus. In this non title bout Duran was floored on the way to losing a 10 round decision. After this fight Duran went on a 32 fight winning streak he accumulated a spectacular 25 KO’s. During this winning streak he defended his title 13 times and in his last fight as a light weight he added the WBC version of the title to his WBA belt. In this fight Duran Knocked out his old adversary De Jesus for the second time and won the trilogy between them 2-1. Duran was king. No one at lightweight could handle Duran’s power; he was simply a knockout artist with crippling power in either hand. This, combined with his style set him apart from the rest of the pack. His reign as lightweight champion is on which his legacy would be based, no one can argue that Duran is one of the best light weights of all time. But this wasn’t enough, one man stood above all in boxing, he was fast, slick a gold medallist comparable to the great Muhammad Ali in many ways. ‘Sugar’ Ray Leonard, the king of the welterweights. After such an incredible career at lightweight, Duran moved up to join the welterweight division. After a few tune ups, he was ready for the biggest fight of his life. The two meet in what will forever be known as ‘The Brawl in Montreal’ It was a great clash of styles, the brawling aggressive Duran vs. the slick boxing of Ray Leonard; at least that is what it should have been. From the bell Duran forced Leonard to fight on his terms. Duran was simply great that night, he out worked Leonard on the inside and didn’t let Leonard box. In the end there was only going to be one winner, Roberto Duran had done the impossible, he moved up to welterweight and dethroned its king. Duran returned home to the people of Panama lining the streets, he was a hero again, never before had the people had a figure like Duran to aspire to be. For all the admiration what would follow in the rematch would follow Duran his whole career, the man who prided himself on being a tough fighter with no quit uttered the infamous words ‘No mas’ and the fight would forever be remembered for those two words. The fight wasn’t going as Duran would have hoped Leonard was boxing, and taunting Duran. In the 8th round, Roberto Duran raised his arms and uttered the infamous words and walked to his corner. Ray Leonard had avenged the only lose on his career and with it delivered a blow that Duran would never really recover from. When Duran returned home, there weren’t the people of Panama lining the streets; there was nobody there for Duran. ‘No mas’ is sadly, and wrongly often remembered as the defining moment of his career, but after such a black day Duran came back and his return to glory came at another weight, despite losing to Wilfred Benetiz for the WBC light middle weight title and then losing a huge upset in his next fight. Duran was matched against Pipino Cuevas. Well, if anyone thought Duran was shot he silenced a lot of people that night. He destroyed Cuevas in four rounds, his best display since beating Leonard in Montreal. The fight earned him another shot at the light middleweight title. His opponent, the unbeaten Davey Moore. Duran was a 5-2 underdog going into the fight but only a fool would have completely counted out the hands of stone. Duran dominated the fight in such a one sided fight it was impossible not to feel sorry for Davey Moore. Duran was better in every department, he hammered Moore with what ever shot he wished, when Moore hit Duran he walked through the shots and proceeded to hammer home hard lefts and rights. For 8 rounds Moore took a horrific beating, his right eye swelled completely shut, as the saying goes, not even his mother would’ve had trouble recognising him. In the 8th Duran unleashed a vicious combination that rattled Moore to the bones and he finally crumpled to the canvas but he beat the count and walked into the firing squad. Once again Duran beat up Moore, he looked to the ref, as if to ask him to stop the fight, but it continued. Duran landed a huge right hand straight down the middle that sagged Moore against the rope and Duran hammered more shots in before, finally. The doctor at ringside got on the apron and called it off all be it too late, the beating Moore received should have been ended much earlier, before Duran broke his nose and dealt out one of the worst beatings in a prize ring. Duran had returned to the top of the pile in a third weight division. Not content with this, he challenged the reigning middleweight champion, none less than Marvellous Marvin Hagler. Duran now 2 full weights above his best was challenging another true great in Hagler, he was a beast of fighter. He had a chin chiselled from pure granite and could knock you out with either hand from either stance. For 15 hard rounds they fought tooth and nail. The weight showed on Duran, he was landing clean shots on Hagler, but the power that would have ended so many fighters nights at light weight, and even welterweight simply wasn’t there. Hagler wobbled Duran on a couple of occasions but Duran was game until the end despite losing quite a clear unanimous decision, he had far from disgraced himself. The most shocking lose on Duran’s record would come against Tommy Hearns. Back at light middle weight the two were to meet. Both had lost to Leonard previous to this fight, but it was none less of a spectacle. What unfolded was incredible. Tommy Hearns simply blasted Duran from the opening bell, Duran tasted Hearns’ gloves throughout the 1st round, and then he tasted the canvas. In the second and final round Duran was still on unsteady legs, he found himself backed on to the ropes and Hearns threw two great shots and Duran was out before he hit the ground. It was a knockout of such magnitude that once again people were counting Duran out, and who could blame them, he had just lost two of the biggest fights of his career and the second in such incredible style. I will refer to the word that describes Duran best, and that is ‘great’ a word that is used far too liberally but not in this case. Duran would once again earn the tag of a great fighter in 1989. He challenged the middleweight champion Iran ‘The Blade’ Barkley. In his previous bout The Blade had beaten an old adversary of Duran’s. Tommy Hearns no less. Barkley stopped Hearns in the 3rd round, there was little hope held for Duran. But what do great fighters do? They defy the odds, they win under the toughest circumstances and Duran did just that. He won a split decision and claimed a world title in a 4th weight division, and with it set up a final fight with his tormentor Sugar Ray Leonard. Despite winning two world titles since the infamous ‘No Mas’ incident it was still a monkey on Duran’s back. By now it seemed that Duran truly hated Ray Leonard and was determined to prove himself against him. The fight would take place at super middleweight. Duran was 38 years old and fighting a good 25lb above his prime weight. The trilogy went Leonard’s way, he won an unanimous decision over Duran in what was a below average performance for Duran, he did however leave Leonard a reminder of Montreal, in the final round Duran cut Sugar Ray’s eye with an overhand right. After this fight Duran continued, he fought 6 more times for world tiles losing 5 of them and winning a minor title at super middle weight. Duran fought his last fight to date against Hector Camacho. He lost a 12 round unanimous decision. The very fact that Duran fought 12 rounds against Camacho is a feat in its self, especially when you consider Duran was nearly 50 years old. Ironically it was also Camacho who ended the career of Sugar Ray Leonard. Duran fought in one of the best eras of all time. Duran, Hagler, Hearns and Leonard made up a generation of fighters known as the fabulous four. They fought each other 9 times and between them had some real classic fights. In my opinion the only era of boxing that ranks as highly is the heavyweights of the 70’s where we saw Ali, Frazier and Foreman in some epic battles.